Sunburst is an excellent example of the fine genetics from the final Peruvian importation of 1998 and she has been a great producer for us. She is a wonderful proven mom with dense fiber and still excellent conformation. 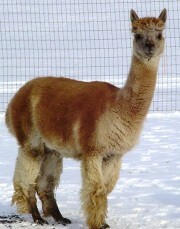 Her 2002 cria, Starburst, is an example of the ribbon quality offspring that Sunburst produces. Her 2003 cria, Orion (sold), was out of nationally award winning Legacy’s Lustroso. Riana (sold), Sunburst’s 2004 cria out of Snowmass Cangalli Gold, has wonderful beige fiber and is also ribbon quality, taking blue at the 2005 MAPACA Jubilee. Sunburst gave us Warrick (sold), a white male out of Snowmass Prodigy in 2005 and was then re-bred to Snowmass Incaaccoyo Star producing Estrello (sold) in 2006, another wonderful I-Star combination. For 2007, Sunburst was bred to El Numero Uno, which proved to be a great combination giving us Leilah (sold) and showing Sunburst is capable of producing darker colored offspring. For 2008 Sunburst was bred to Simba, giving us Tau (sold), a fine white male followed by a brown male out of Quentin (sold), her darkest color produced yet. 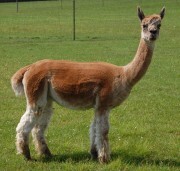 Sunburst’s 2012 cria out of Archangel’s Jered, has her coloring so we’re very pleased. With many other females to breed and since we are keeping our herd additions low, this is likely to be Sunburst’s last breeding for us. Purchase Sunburst in a package with 2 other females for $1000.